The 2019 Power of Possibilities event was made possible by title sponsor, Carole Middleton, and the following platinum sponsors: Cotchett, Pitre & McCarthy, Gatepath Auxiliary, and Sutter Health, Mills-Peninsula Medical Center. Other corporate sponsors included Arborwell, Bailard, Barulich Dugoni & Suttmann Law Group, Inc., Heffernan Insurance Brokers, SC Properties, D’Elia Construction Inc., Electronic Arts, GoPro, Graybird Foundation, Norman S. Wright Mechanical Equipment, Oracle, and Wells Fargo. Gatepath has been a cornerstone of our community for more than 98 years, providing support services to individuals with special needs and developmental disabilities in the greater San Francisco Bay Area. Our mission is to empower people with special needs to achieve their full potential through innovative, inclusive programs, and community partnerships. With educational, therapeutic, vocational, and family support services, we provide support to an individual throughout his or her lifetime. We collaborate with businesses, third-party providers, local nonprofits, and various other organizations to bring the highest quality services to the children, youth, and adults in our programs. Together, we are creating a world where people of all abilities are fully accepted, respected, and included in all aspects of life – in the classroom, in the workplace, and in our communities. For more information, visit Gatepath.org. 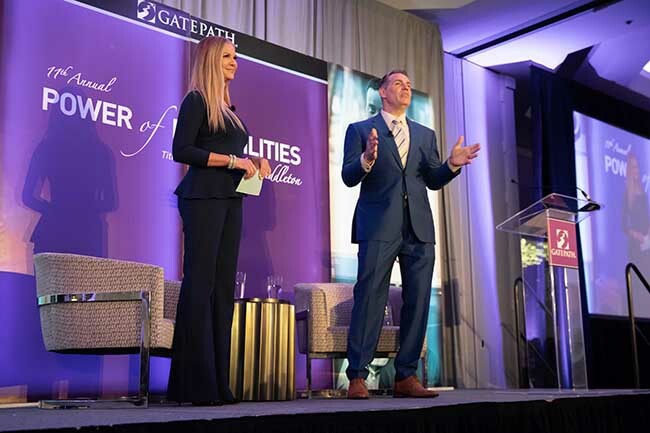 Burlingame, CA — Two-time NFL MVP and Super Bowl champion Kurt Warner will be the guest speaker at Gatepath’s 11th Annual Power of Possibilities event on March 21, 2019 at the San Francisco Airport Marriott Waterfront in Burlingame, CA. While Warner’s football narrative reads like a rags-to-riches Hollywood script, it is the story of a man filled with dignity and class that captured the imagination of sports fans and so many others worldwide. During his 12-year career, Warner continually beat the odds to quarterback the St. Louis Rams and the Arizona Cardinals to the Super Bowl and etched his name in the NFL record books along the way. Warner’s football success is truly impressive. But his gridiron accomplishments pale in comparison to his dedication to the community. Warner believes that all people, regardless of ability, have a purpose and calling in life, and that everyone can participate in meaningful and challenging activities, establish personal relationships, and contribute to society when provided with the appropriate support and opportunities. Inspired by their son Zachary, who is blind and has developmental disabilities, Kurt and his wife Brenda founded Treasure House, a supportive living community for young adults, focused on independence, respect, and community integration. Their vision for the future is to replicate the model and help individuals with intellectual disabilities realize their full potential. “People are going to forget that I won a Super Bowl, but they’re never going to forget the kind of impact you had on them personally,” said Warner in an interview with CBS Evening News. Emmy Award-winning journalist Nancy O’Dell will join Warner onstage as moderator of the Power of Possibilities conversation about their personal connection to the intellectual and developmental disabilities community and the importance of advocating for inclusion in society. A proven force in all areas of her career as a host, author, producer, and entrepreneur, O’Dell is the co-host of Entertainment Tonight, contributes to CBS This Morning, and is the go-to anchor for live TV specials. Tickets for Gatepath’s Power of Possibilities event will be available starting February 1, 2019 at Gatepath.org/POP-2019. The 2019 Power of Possibilities event is being made possible by title sponsor, Carole Middleton, and the following platinum corporate sponsors: Cotchett, Pitre & McCarthy, Gatepath Auxiliary, and Sutter Health, Mills-Peninsula Medical Center. Other corporate sponsors included Bailard, Barulich Dugoni Law Group, Inc., Janice Berthold, Heffernan Insurance Brokers, D’Elia Construction Inc., Electronic Arts, Graybird Foundation, Norman S. Wright Mechanical Equipment, Oracle, and Lisa and Kevin Cullinane, SC Properties. For more information about becoming a sponsor or benefactor of the Power of Possibilities, CLICK HERE. Gatepath’s Power of Possibilities event celebrates and supports the achievements of those with developmental disabilities in our community and is perfect for anyone who wants to create a world where people of all abilities are accepted, respected, and included. The Power of Possibilities is known for its powerful keynote speakers. Last year, actor Patrick Dempsey talked about how growing up with a learning disability shaped his perspective on life and helped him become a successful actor. Award-winning actor Colin Farrell, Glee actress Lauren Potter, former San Francisco 49er quarterback Steve Young, and actress and author Holly Robinson-Peete were also previous keynote speakers. Attendees of this event call the Power of Possibilities “magical,” “heartwarming,” and “empowering.” Proceeds benefit Gatepath – the largest nonprofit in the Bay Area supporting individuals with developmental disabilities to achieve their full potential. Gatepath has been a cornerstone of our community for more than 98 years, providing a lifespan of support services to individuals with special needs and developmental disabilities in the greater Bay Area. Our mission is to empower people with special needs to achieve their full potential through innovative, inclusive programs and community partnerships. With educational, therapeutic, vocational and family support services, we are distinctive in providing support to an individual throughout his or her lifetime. We collaborate with businesses, third party providers, local nonprofits and various organizations to bring the highest quality services to the children, youth and adults in our programs. Together, we are creating a world where people of all abilities are fully accepted, respect and included in all aspects of life – in the classroom, the workplace and in our communities. Join us in “Turning Disabilities into Possibilities”. For more information, visit Gatepath.org. 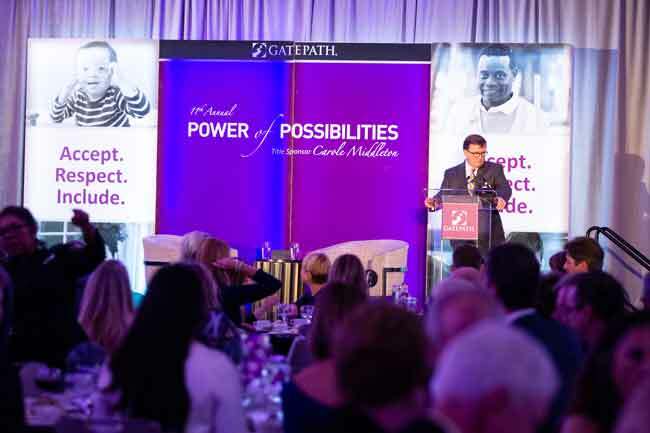 The 2018 Power of Possibilities event was made possible by title sponsor, Carole Middleton, and the following platinum sponsors: Cotchett, Pitre & McCarthy, Sharon and Joel Friedman, Gatepath Auxiliary, Goldman Sachs Gives, GoPro, Sara and James Jungroth, and Sutter Health, Mills-Peninsula Medical Center. Other sponsors included Bailard, Barulich Dugoni Law Group, Inc., Janice Berthold, Heffernan Insurance Brokers, Kathryn and Richard Breaux, Elaine and George Cohen, D’Elia Construction Inc., Electronic Arts, Karen and Todd Gemmer, Graybird Foundation, Linda and Richard Leao, Diane Christensen Mason and Charles H. Mason Jr., Katie and Bryan Neider, Norman S. Wright Mechanical Equipment, Oracle, Barbara and Paul Regan, Lilli Rey, and Wells Fargo. Click HERE to view images from the event. Gatepath has been a cornerstone of our community for more than 97 years, providing support services to individuals with special needs and developmental disabilities in the greater San Francisco Bay Area. Our mission is to empower people with special needs to achieve their full potential through innovative, inclusive programs and community partnerships. With educational, therapeutic, vocational, and family support services, we provide support to an individual throughout his or her lifetime. We collaborate with businesses, third-party providers, local nonprofits, and various other organizations to bring the highest quality services to the children, youth, and adults in our programs. Together, we are creating a world where people of all abilities are fully accepted, respected, and included in all aspects of life – in the classroom, in the workplace, and in our communities. For more information, visit Gatepath.org. Our local online resource center is available at Smcfrc.org, where families can connect to invaluable resources and support services. Burlingame, CA — Gatepath announces award-winning actor Patrick Dempsey as guest speaker for the 10th Annual Power of Possibilities event on March 8, 2018. Dempsey, best known for his role as neurologist “McDreamy” on the hit television show Grey’s Anatomy, was diagnosed at the age of 12 with a learning disability. In a conversation moderated by ABC TV News Anchor Dion Lim, Dempsey will share how growing up with a learning disability built perseverance and shaped his perspective on life. “You have to keep working. I have never given up,” he said in an interview with Barbara Walters. The Power of Possibilities is known for its notable speakers. Last year, actor Colin Farrell talked about how raising a son with special needs has positively impacted his life. Glee actress Lauren Potter, former San Francisco 49er quarterback Steve Young, and actress and author Holly Robinson-Peete were also previously featured guests. 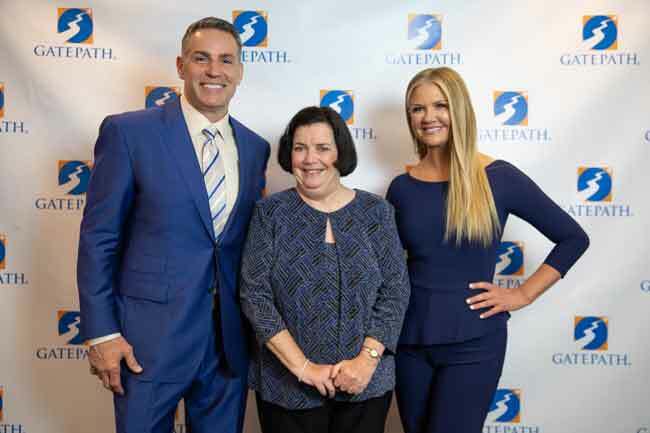 Gatepath is celebrating more than 98 years of serving children, youth, and adults with special needs and developmental disabilities in the Bay Area and providing support to families. The Power of Possibilities event is made possible by our title sponsor, Carole Middleton, and the following platinum sponsors: Cotchett, Pitre & McCarthy, Sharon and Joel Friedman, Gatepath Auxiliary, Goldman Sachs Gives, GoPro, Sarah and James Jungroth, Sutter Health, Mills-Peninsula Medical Center. Other sponsors who are generously supporting the event are Bailard, Barulich Dugoni Law Group, Inc., Janice Berthold, Heffernan Insurance Brokers, Kathryn and Richard Breaux, Elaine and George Cohen, D’Elia Construction Inc., Electronic Arts, Karen and Todd Gemmer, Graybird Foundation, Linda and Richard Leao, Diane Christensen Mason and Charles H. Mason Jr., Katie and Bryan Neider, Norman S. Wright Mechanical Equipment, Oracle, Barbara and Paul Regan, Lilli Rey, and Wells Fargo. Learn more about this at www.gatepath.org/POP. Get you tickets for The Power of Possibilities now! Ticket sales end Friday, March 6, 2017! A Personal and Candid Conversation with Colin Farrell, hosted by esteemed Bay Area news anchor and journalist, Diane Dwyer! Dream Drawing to win one of three fabulous prizes! Social Hour Mix & Mingle with like-minded social entrepreneurs, business and nonprofit leaders. Complimentary wine! Art Exhibit featuring an eclectic array of creative art therapy pieces available for purchase! Delicious Dining Experience with specially prepared cuisine paired with local fine wines! Live Auction of other amazing prizes, including tickets to the ESPY Awards! Achievement Award Winner Announced Live, recognizing the accomplishments of someone who has faced challenges and ultimately achieved their dreams! The proceeds from this event benefit Gatepath, the largest nonprofit in the Bay Area supporting the hopes and dreams of the children, youth and adults with disabilities. Join us for this unforgettable evening. Since 1950 the Gatepath Auxiliary has supported children and adults with special needs through the programs and services of Gatepath. The Auxiliary strives to encourage and enhance personal growth in those we serve by providing financial support to Gatepath and volunteering at special events. Gatepath Auxiliary is a registered 501(c)(3) non-profit organization.